Office users who use run-a-script rules are discovering their scripts are currently disabled (as is Start Application), thanks to a security update. When the update is installed, any existing run-a-script and run application rules will be disabled. To fix, you need to set the EnableUnsafeClientMailRules value in the registry then restart Outlook. If you don't want to edit the registry yourself, you can use this ready-to-use .reg file. One option is to convert the run-a-script to an ItemAdd macro. Depending on the conditions in your rule, converting it to an ItemAdd macro may be as simple as adding the application startup macro, renaming the script, and adding an If statement. For information on using ItemAdd macros, see How to use an ItemAdd Macro. Thank you for all this work, and posting it so nicely and thoroughly! I am not sure if I should put it somewhere else? but it doesn't run. When you can't use it in a rule, you either need to use an itemadd macro or run the macro manually. You can use a 'stub' macro to process the currently selected item with the script. It doesn't need to be in ThisOutlookSession if its not running automatically, but should work in either ThisOutlookSession or a new module. Sorry I missed this earlier. :( What macro are you using? The error 'Run-time error '438': Object doesn't support this property or method' indicates you are running the macro on a item that doesnt have the field the macro is looking for. Why in O2016 list with scripts is empty? What is the script title? Where is the script stored? The title needs to be something like sub macroname(item as mailitem) to show in the script list. It should be in a module - while they will usually work in ThisOutlookSession, on occasion, they won't show up in the list. have you saved the script in VBA window (Alt+F11) first? Thank you! This got my rule and macro running again! While macros could be a security risk, for some of us they are definitely a time and labor saving feature! I found this works for Outlook 2010 as well. Recent security updates effectively killed some of my rules that ran scripts. I simply put the same value in the HKCU\Software\Microsoft\Office\14.0\Outlook\Security key. I did discover that beyond simply exiting and restarting Outlook, it was necessary for me to restart my workstation completely before all functionality was restored. Thank you for this registry edit. 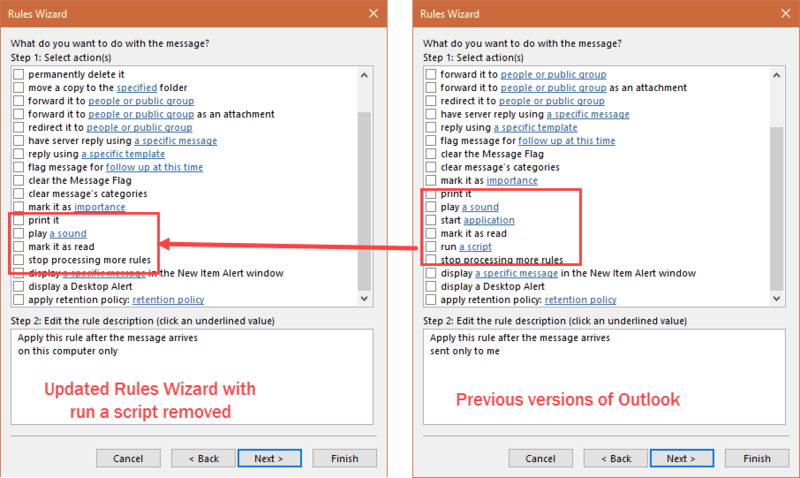 A recent security update rendered some of my Outlook 2010 rules disabled. Finding no other explanations, I tried inserting the "EnableUnsafeClientMailRules" value in the \Office\14.0 portion of the registry. While I am now able to edit the rules and the Run a Script option is back in the actions portion of the rules editor, the macros will not run. They do not throw up any error messages, they just don't run. The trust center settings have not changed any, the macros have a trusted digital signature and the macro settings are set to prompt. I don't even get the prompt now. Any ideas are welcome and appreciated. What does the script do? If you add msgbox "Rule is working" at the very top of the script, does it work? Didn't work 2016, it worked before but this time no good, any ideas please? You set the new registry key to allow run a script rules? You need to restart Outlook for it to take effect. Thank you very much!! this was great info that solved my issue.